The Model CRX-VF is a cryogen-free, closed-cycle refrigerator probe station enhanced with a ±2.5 T vertical field superconducting magnet. It performs CV, IV, microwave, and electro-optical probing, plus out-of-plane vertical field superconducting magnetic measurements. 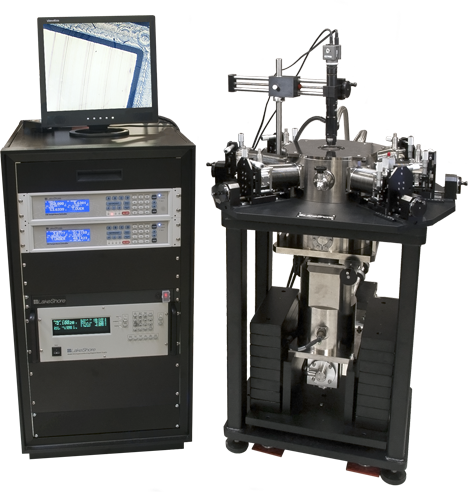 Researchers can use the CRX-VF for performing Hall effect measurements and testing magneto-transport parameters. It is designed to enable true 90° wafer probing on wafers up to 51 mm (2 in) in diameter. The sample is maintained at elevated temperature during cool-down, reducing the potential for condensation, a critical requirement for measuring organic materials.